The first daughter's eyes seem to change colour... a lot. Some people have noticed something curious about Ivanka Trump: her eyes seem to change colour. 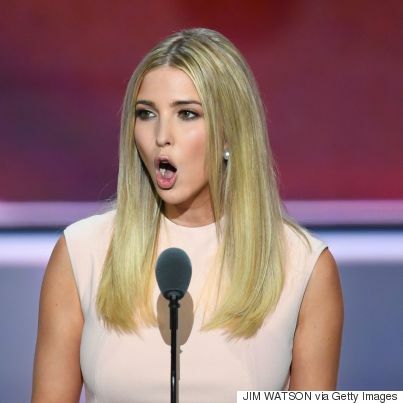 Esquire observed last fall that the first daughter’s peepers have appeared brown, green and even a greenish-blue at different times in her life. It appears brown is her natural colour, however, after a peek at photos from when she was a teenager. Ivanka’s press representatives told Esquire in an email that they wouldn’t comment on whether she wears contacts. But one optometrist is pretty sure she does. "These definitely look like coloured contact lenses, her eyes are a darker, natural chestnut colour," Jacob Nachum told Inside Edition after looking at photos. "They are not going to change this amount." And Refinery29 noted that her eyes look different depending on the event. At an informal roundtable discussion with female business leaders and Prime Minister Justin Trudeau in February, her eyes were brown. But during her Republican National Convention speech last summer, a more high-profile event, they looked green. It also looks like she slipped in the green contacts for an interview with "CBS This Morning" earlier this month. We may never know her strategy for changing up the colour, if there is one at all, but it's definitely an interesting fashion choice for an adviser to the President of the United States.